In order to have a stunning wardrobe, we need basics. That means tops that won’t go out of style in a year or even five. It means a shirt that’s there for us when we absolutely, positively have nothing else to wear — not because it’s a last choice, but because it’s such an easy first choice. The Style & Co Chiffon-Hem Top is a basic that’s anything but. It’s simple enough to wear with just about any piece in our closet, but has unique features we’d never find on a plain, old T-shirt. Perhaps that’s why nearly 1,000 shoppers have expressed their love for it! 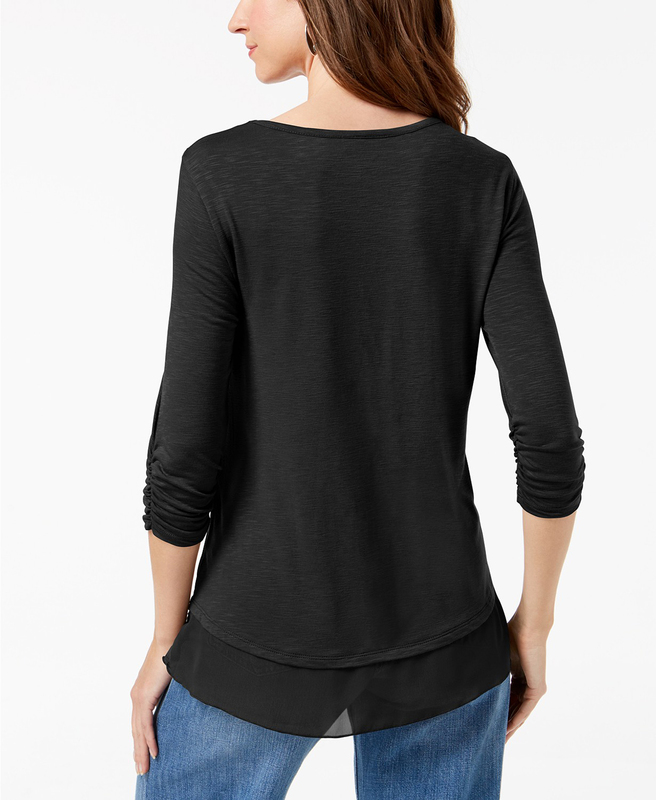 See it: Get the Style & Co Chiffon-Hem Top for just $16 from Macy’s! Hurry, because this sale ends February 9, 2019! A common theme among shoppers’ comments is the joyful realization that the colors of this shirt are even more vibrant and beautiful in real life than they are online. One shopper said “everything about this top is perfect,” while another detailed how she wears it. They suggest that we “layer on the jewelry” and “throw on a fancy sweater or jacket,” saying it’s the “best plain layer to dress up.” Sometimes, we get so lost in layers that we forget that we need a reliable base. This top is a starting line from which we already know we’ve won the race. So what is different about this top than others? Let’s start with the sleeves. They’re three-quarter-length, falling a bit below the elbows. We love sleeves this length because of how easy they are to layer underneath a jacket or sweater. There will be no bunching up around the wrists, which means no squeezing our fingers into the tight jacket sleeve to try to tug our shirt sleeve back down. These sleeves have ruching, too, cinching just around the elbow, immediately dressing this top up. The other feature that massively upgrades this basic is the chiffon hem. Chiffon is already such a pretty fabric that flows and floats effortlessly on our body. Here, it peeks out at the bottom for an almost peplum-like effect, but without the flare. It gives us the look of an extra layer without the feeling of wearing one. It falls below the hip, which is super flattering, and totally long enough to wear over leggings! Back at the top of this top is a scoop neckline, which many shoppers find is the perfect backdrop for a long necklace. One said they received many compliments when wearing theirs with a water pearl necklace. We’re feeling inspired! The fabric of the shirt itself is very soft and thin, which usually means we’ll need an undershirt to go along with it. That’s not an issue here! This shirt demonstrates that “thin” does not automatically equal “see-through.” With its high-quality material, it proves that without a hitch. This top is currently available in six colors, ranging from deep and dark to bright delights. For a shirt that goes with everything and can be dressed up in a snap, there’s Deep Black. Also on the captivatingly dark side is Mountain Blue, a navy that would pair nicely with light-wash jeans or even white pants. Alternatively, we can choose Deep Mocha, which is a blend of brown and grey that serves as a neutral. Looking for more colorful options, too? This is the right place. Magenta Blossom is a vivid color that manages to be bright even while staying in the deeper shade range of pinks. This color would work well as a pop underneath a black blazer for a professional look, or on top of mesh-panel leggings to capture a carefree athleisure vibe. If we prefer more of a coral pink, Pimpernel is the shade for us. It combines pink, orange and red to create a sunset-chic base for an ensemble. Speaking of sunsets, the color of Gold Curry often appears in them as well. This shade hits right in the middle of a mustard yellow and a bright, springtime yellow, and deserves to be paired with other pops to be fully appreciated, like blue gem earrings or a matte berry lipstick. The sale on this top, which was made specifically for Macy’s, will be over in the blink of an eye, so run, don’t walk to that “Add to Bag” button! It’s 53-percent off now, but won’t be for long, and we don’t want anyone to miss out! It’s not every day a basic this chic is this cheap! 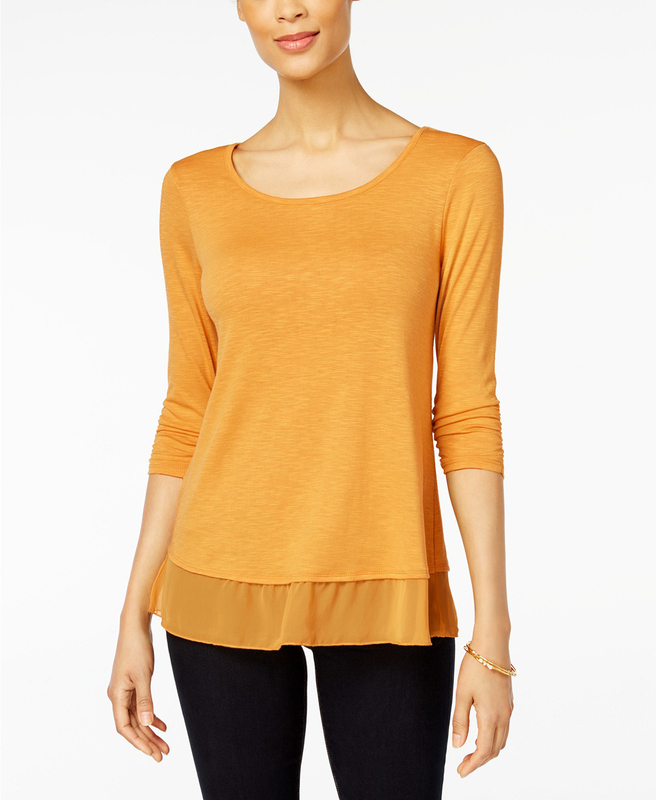 See it: Get the Style & Co Chiffon-Hem Top for just $16 from Macy’s! Hurry, because this sale ends February 9, 2019! Not your style? Check out other tops from Macy’s here!